This cozy, whimsical, DOG FRIENDLY, island style cottage is located in the enormously popular, small beach side community of Old Florida Cottages on the south side of Scenic Hwy 30A. There are no roads to cross going to the beach...which is only 200 yards away .Or simply step out the back door and walk TEN easy steps to the newly renovated pool and picnic area. This tropical home is perfect for a small family or two couples. The master bedroom has a king-size bed with private bath and balcony. The guest bedroom has a queen-size bed with private bath and balcony. Both have flat screen cable TVs. For your convenience, each bath has a hair dryer. (Both beds have quality firm, pillow top mattresses for extra sleeping comfort.) Upstairs balconies have deep hammocks that invite you to nap daily. And, acclaimed juried artist, Tim McAllister, has created - just for Mellow Yellow - an awesome Dolphin underwater viewing mural on the upstairs landing that will captivate you and bring you a sense of calm and peace. His art can also be found in other areas of the house and his efforts have truly contributed to the uniqueness of this fun, wonderfully comfortable, home. Children love Mellow Yellow! The first floor has an open plan with front and back porches. The living room - which has art/decor reflecting the feel of a rain forest - has a queen sleeper sofa and a flat screen color TV with DVD/Radio. There is also a CD/tape player for your enjoyment. The dining room has an oval table that will comfortably seat six. Four adjacent bar stools allow you further seating. The fully equipped gourmet kitchen makes meal prep a breeze. Whip up a batch of margaritas in the blender to sip while watching the sunset. Or, how about a 'cheeseburger in paradise' concocted on your own grill on the back porch? WiFi available. Within walking distance are some great eateries, and delightful shopping, at Gulf Place. Scenic 30-A boasts wonderful restaurants, many of which have been written up - and rated well up there! - in Bon Appetite and other food periodicals. And Goat Feathers, just steps away, has a seafood market on site. Nearby you'll visit Silver Sands, the largest outlet mall in the States, Sandestin - with its great golf, boutique shopping, and even more fine restaurants - Santa Rosa Beach and Golf Club located right on 30-A, Grayton Beach, Water Color, Rosemary beach, Alys Beach, and world renowned Seaside, where the Truman Story was filmed. Experience beautiful beaches with sugar white sand that stays cool on the hottest day. I'm a panhandle native, lived and cruised on a 60' sailboat for well over a decade (many years in the islands) and I STILL LOVE THIS BEACH - with a passion! The stroll to get there is easy for even small children. POOL IS NORMALLY HEATED FROM MARCH 1 - OCTOBER 31. Please contact me to verify. We would like to announce that we have a lovely, ADULT ORIENTED, sleek and very eclectic (NOT your ordinary beach rental), big sister home located in Dune Allen Beach, just a four minute drive away from Mellow Yellow...EUROPA! Very different from this cottage, but full of treats for the discerning guest...and dog friendly, too. Please see 'my other homes' noted below. A world traveled local who still feels Santa Rosa Beach/30-A is an exquisite destination. Perfect vacation home located in a perfect spot. Easy beach access, pool, shopping, restaurants, activities ~ and the pups can come too! South of 30A location - Children needn't cross active road. Upstairs baths include tub/shower combination (easy to bathe the little ones). 200 yards to the Gulf, an easy stroll even for little ones. South side of 30A. 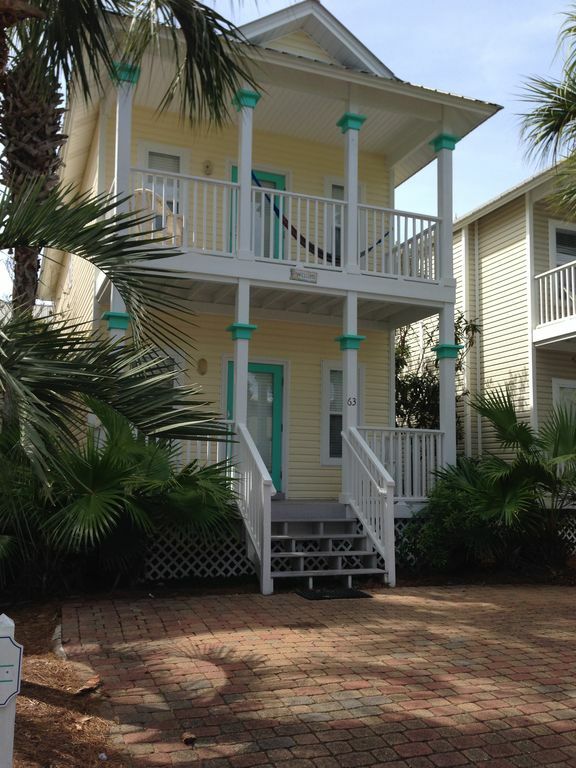 Mellow Yellow is located in the very popular Old Florida Cottages community, south of 30A. This small collection of charming homes has become a destination unto itself! Great location! Adaquate parking for two cars. The kitchen has great light - from the window over the sink as well as overhead - and is stocked well for meal preparation. Many families purchase beach toys/games for their children and very often, rather than take them back home, leave them in the closet on the back porch for others. Check for possible goodies there!! Great pool area and is just steps away from the back porch. Mellow Yellow was exactly as promised. Loved the decor. We and our dog felt right at home. Clean. Comfortable. The owner called the first day to be sure everything was good for us. She had gotten a new couch and even added a new Netflix/Amazon accessible TV just before we arrived. When the tv needed to be re-adjusted by the media company, the owner was immediately responsive and got it taken care of. And the location was perfect- close to the beach, walking trails, and restaurants. Thank you so much. We thoroughly enjoyed having you and your sweet pup and are delighted that you've elected to return next year! Cheers and Woofs! Aside from tropical storm Gordon dropping a lot of rain, we loved our stay at Mellow Yellow. It’s in a great location and has all the amenities. Thank you so much for sharing your home. We would definitely return. Clean, cozy, close to the beach! We loved our stay at Mellow Yellow. We have always rented homes through VRBO and this was the first time an owner, Pat, called to make sure we arrived safely and to confirm everything was in order! The home is very clean. I loved getting up before everyone else and taking the short walk to the beach in the early mornings. We did not cook much but the kitchen was spotless and had everything you could need. My favorite part of Mellow Yellow were the bedrooms. The bright walls and beautiful quilts made both bedrooms so comfy and cozy. We would stay at Mellow Yellow again! We enjoyed our time at Mellow Yellow. It was as described. Fun and comfortable. Great neighborhood, great location and close to pool and beach. And our dog loved it too! Pat was easy to work with on anything. We would definitely recommend Mellow Yellow. Thank you for sharing your home. We enjoyed staying in mellow yellow, having a dog friendly place to stay made our vacation complete. NOTE: We observe a four night minimum in spring, fall and winter. High season is a seven night minimum and is scheduled on a Saturday to Saturday basis. Cleaning is included in the rental rate unless otherwise specified. Your Pet Deposit is included with the Damage Deposit; it is 100% refundable if all is well upon departure. We don't charge extra for pups. Rates are subject to change unless reservation is in place. January and February monthly rentals are available. Contact Pat. .